Many of you might have followed my series, Confessions of New Construction, which focused on my experiences while building our new home this last year. Now that we are moved in, the new phase of owning a home is beginning. My new series, while short, will highlight some of the things many people don’t think of when building a new home. One thing many new home buyers forget to think about are the costs that arise after you move in. One that we almost forgot about was that our home would need gutters, since they were not offered by our builder. Call it a warranty issue or something like that. But anyway, having never had to fund gutters before, I called three different Minneapolis vendors for pricing. Two were referred to me and the other I picked up at a trade show. The new thing in gutters is seamless construction. Less seams mean better looks, and you can get them in aluminum or steel. One company we met with promoted steel gutters and that they would hold up to anything, but at a cost of $3000, our wallet’s heart skipped a beat in disbelief. We went on to look at two other companies who used aluminum gutters. They came in around $1250 and $1500. Before anyone came out to give us estimates, we looked at all the places that would need gutters. Right away I knew the corner of the porch would be a problem (pictured above) because it had this small 90 degree turn. How the companies handled this problem was going to tell me how smart they were. 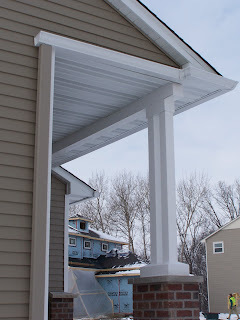 The lower priced guys said no problem, but the expensive company tried to tell me that the only way to make the downspout work would be to have it follow the porch post down to the ground. They would bend it to fit the post, then have it go down the brick base. Now, I had to look at that and wonder what this guy was thinking. I can’t even begin to tell you how ugly that would look, not to mention take away from the architecture of the craftsman inspired post design. I’ll let you guess who we didn’t pick! In the end, we decided that “gutters are gutters” and that there was no need spending a lot of money on these things. Even though the warranty is only good for 10 years, we don’t plan on being in this house that long. Two weeks after closing, our new gutters were installed in a couple of hours. We even were able to get down spouts that matched the color of our siding to blend into the home. They look great! If you don’t put them on, you will have a little moat running around the home from water cutting into the ground.